Further magnitude estimates are as follows: Feb. 27.68 UT, 8.53 PEP V (A. Gilmore, Mt. John University Observatory, New Zealand), and 27.68, 8.7 (A. Jones, Nelson, New Zealand) (via Nova Network); and 28.41, 8.5 (C. Scovil, Stamford, CT); Feb 28.41, 8.4 (J. Griese, Stamford, CT); Mar 1.07, 8.0 (D . Overbeek, Edenvale, South Africa); 1.10, 8.0 (Overbeek). Accompanying is a finder chart for N Sgr 94 prepared by C. Scovil. 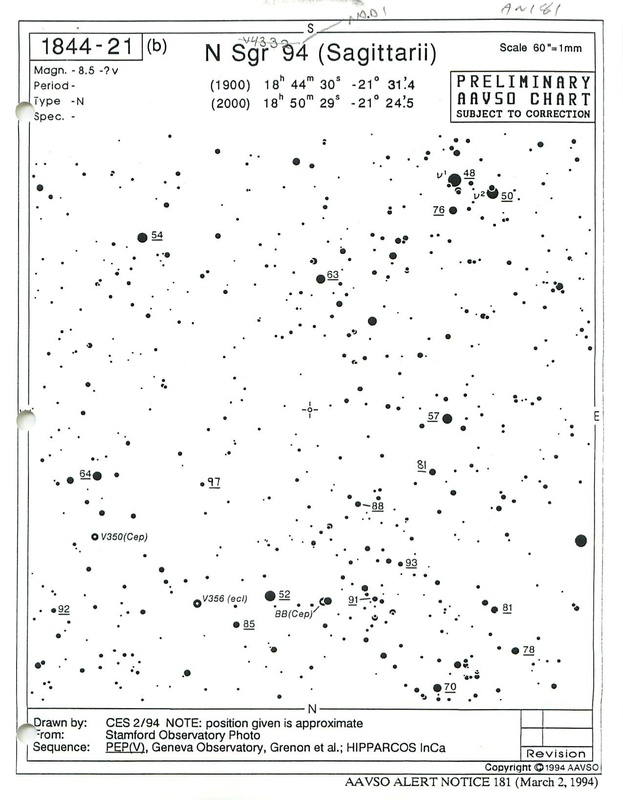 Please use this chart to observe the nova and telephone your observations to AAVSO Headquarters so we may inform the astronomical community. Please indicate which comparison stars you have used in making your estimates. Congratulations to M. Yamamoto on his discovery! Feb 1.00 UT, 8.3 (J. Bortle, Stormville, NY); 1.02,7.90 PEP V (D. Curott, Florence, AL); 1.09, 8.0 (R. Royer, Lakewood, CA); 1.09, 8.1 (P. Collins, Scottsdale, AZ); 1.10, 7.90 PEP V (B. Hakes, Peoria, IL); 1.10, 8.29 PEP B (Hakes); 1.90, 8.2 (G. Poyner, Birmingham, England); 1.98, 8.1 (F. West, Hanover, PA); 1.99, 8.0 (R. Stewart, Rochelle Park, NJ); 2.04, 8.2 (Poyner); 2.16, 8.4 (Collins); 2.98, 8.2 (West); 3.02, 8.43 PEP V (Curott), 3.05, 8.5 (A. Dill, Wichita, KS); 3.11, 8.4 (D. York, Abiquiu, NM); 3.16, 8.6 (Bortle); 3.17, 8.4 (E. Anderson, Yonkers, NY); 4.78, 8.4 (Poyner); 4.81, 8.8 (L. Kiss, Szeged, Hungary); 5.00, 8.5 (West); 5.07, 8.3 (Anderson); 5.81, 8.6 (Poyner); 5.98, 8.5 (Poyner); 6.16, 8.3 (Royer); 6.19, 8.4 (Poyner); 7.00, 8.4 (West); 7.03, 8.3 (Anderson); 8.99, 8.5 (G. Comello, Groningen, Netherlands); 9.11, 8.1 (Royer), 9.81, 8.5 (Comello); 10.04, 8.45 PEP V (Hakes); 10.12, 8.5 (Royer); 10.23, 8.3 (P. Schmeer, Bischmisheim, Germany); 10.94, 8.3 (Schmeer); 10.97, 8.3 (S. Sharpe, Bar Harbor, ME); 12.01, 8.6 (Schmeer); 12.03, 8.5 (R. Hays, Worth, IL); 12.16, 8.49 (Royer); 12.76, 8.7 (Schmeer); 12.79, 8.6 (Poyner); 13.10, 8.6 (Royer); 14.02, 9.4 (Bortle); 14.02, 9.25 PEP V (Curott); 14.03, 9.0 (Hays); 14.04, 8.8 (Anderson); 14.13, 8.5 (C. Scovil, Stamford, CT); 14.76, 9.0 (Schmeer); 14.80, 8.9 (L. Kiss, Budapest, Hungary); 14.99, 8.9 (P. Dombrowski, Glastonbury, CT); 14.99, 9.0 (Gliba); 15.05, 9.0 (Anderson); 15.73, 9.2 (Szentasko); 15.75, 10.2 (Kiss); 15.80, 10.1 (M. Moeller, Timmendorfer Strand, Germany); 15.80, 9.6 (I. Tepliczky, Budapest, Hungary); 15.87, 9.7 (Szentasko); 15.94, 9.8 (Comello); 16.03, 10.1 (C. Stephan, Sebring, FL); 16.04, 9.9 (Hays); 16.04, 9.7 (Gliba); 16.07, 10.1 (Stephan); 16.13, 9.9 (Royer); 16.74, 10.2 (Szentasko); 16.78, 10.1 (Schmeer); 16.82, 10.3 (Szentasko); 16.82, 10.1 (Schmeer); 16.83, 10.1 (Tepliczky); 16.87, 10.2 (Schmeer); 16.91, 10.1 (Schmeer); 16.91, 10.2 (Comello); 16.94, 10.1 (Schmeer); 17.00, 10.2 (Gliba); 17.00, 10.2 (Dombrowski); 17.01, 10.2 (Stewart); 17.03, 10.2 (P. Walker, Middlebury, VT); 17.03, 10.15 PEP V (Curott); 17.06, 10.1 (W. Dillon, Missouri City, TX); 17.12, 10.2 (H. Guidry, Littleton, NC); 17.18, 10.1 (E. Broens, Mol, Belgium); 17.23, 10.2 (T. Vanmunster, Landen, Belgium); 17.23, 10.3 (Schmeer); 17.75, 10.2 (E. Ofek, Tel Aviv, Israel); 17.75, 10.6 (A. Diepvens, Balen, Belgium); 17.77, 10.5 (Vanmunster); 17.77, 10.5 (Broens); 17.80, 10.6 (Vanmunster); 17.80, 10.6 (Comello); 17.84, 10.6 (Vanmunster); 17.85, 10.3 (Schmeer); 17.93, 10.7 (Schmeer); 18.01, 10.5 (Scovil); 18.03, 10.79 PEP V (Curott); 18.06, 10.6 (Dillon); 18.10, 10.6 (Royer); 18.19, 11.0 (Broens); 18.23, 10.9 (Schmeer); 18.77, 11.1 (Diepvens); 18.78, 11.4 (Schmeer); 18.78, 11.3 (P. Van Cauteren, Aartselaar, Belgium); 18.82, 11.1 (Broens); 18.83, 11.1 (G. Gubbels, Tessenderlo, Belgium); 18.84, 11.2 (Comello); 18.85, 11.4 (Schmeer); 18.86, 11.1 (Diepvens); 18.91, 11.4 (Schmeer); 18.93, 11.1 (Broens); 18.93, 11.0 (Gubbels); 19.0, 11.5 (Dombrowski); 19.00, 11.0 (R. Raphael, S. W. Harbor, ME); 19.00, 11.4 (Sharpe); 19.03, 11.5 (Gliba); 19.05, 11.6 (Guidry); 19.09, 11.3 (Broens); 19.10, 11.2 (Vanmunster); 19.10, 11.2: (Collins); 19.12, 11.4 (Royer); 19.16, 11.1 (Broens); 19.18, 11.3 (Diepvens); 19.22, 11.3 (Diepvens); 19.22, 11.4 (Schmeer); 19.22, 11.3 (Vanmunster); 19.78, 11.8 (Schmeer); 19.83, 11.8 (Schmeer); 19.88, 11.6 (Comello); 20.0, 12.2 (Dombrowski); 20.01, 12.0 (Raphael); 20.73, 12.6 (N. Stoikidis, Larissa, Greece); 20.78, 12.1 (Diepvens); 20.80, 12.3 (Poyner); 21.02, 12.4 (M. Adams, Melbourne, FL); 21.10, 12.7 (R. King, Duluth, MN); 21.13, 12.9 (Royer); 21.20, 12.1 (Vanmunster); 21.94, 12.0 (Diepvens); 22.42, 12.7 (Dombrowski); 23.0, 13.3: (Dombrowski); 25.1, 12.3 (York); 25.14, 12.9 CCD UNFlLTERED (Royer); 25.99, 14.2 (Scovil); 25.99, 14.3 (J. Griese, Rocky Hill, CT); 26.00, <13.8 (Bortle); 27.99, 15.0 (Griese); 28.0, <13.3 (Dombrowski); Mar 1.10, 14.5: (York); 1.12, <14.0 (King); 2.13, 14.6 (York). The optical fading was accompanied by a rapid brightening, followed by a slower increase, in the near-infrared, as reported by Kidger et al. (IAU Circular 5936) and Garnavich (IAU Circular 5941), respectively. Shore et al. (IAU Circular 5934) also report that the observations of N Cas 93 with the IUE satellite confirm the formation of dust in the nova ejecta during the deep optical decline now underway (IAU Circular 5938). Once the reaches its minimun brightness it should start to brighten slowly, perhaps for several months, and then resume its decline, so please keep a very close eye on N Cas 93 in the coming months. Accompanying is an "e" scale chart prepared by C. Scovil. 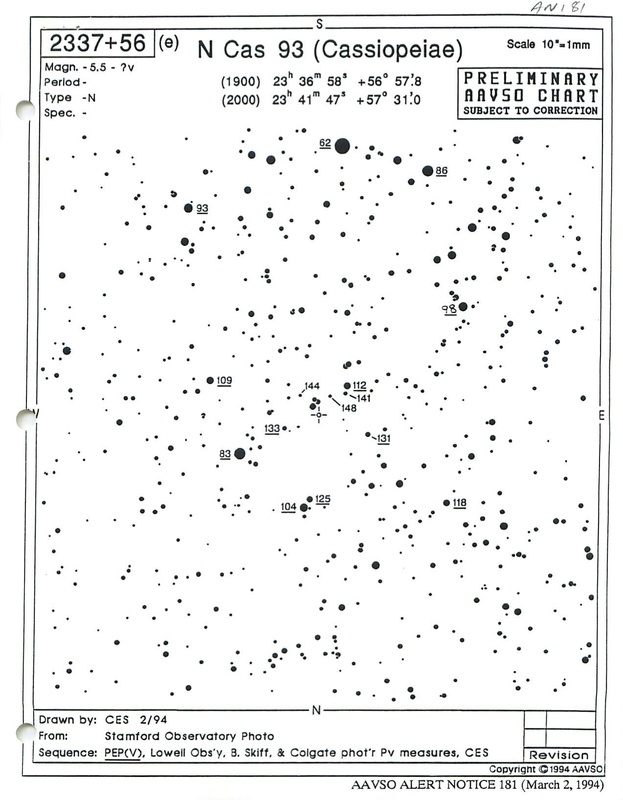 Please use this chart in making observations of N Cas 93 and report your observations to AAVSO Headquarters. Please report the comparison stars you used to make your estimates. In AAVSO Alert Notice 180, we reported that N Cas 93 was discovered by Syuichi Nakano. In fact, it was discovered by Kazuyoshi Kanatsu and the discovery was reported by Syuichi Nakano. We apologize for the error. Many thanks for your valuable observations and dedicated efforts.